The same book as the hardcover edition presented in a softcover version. "Metalcasting Principles & Techniques" is comprised of teaching and lecture material developed during many decades at the University level as part of manufacturing/metallurgical curriculum. Its objective is to serve as a primary textbook for the beginners- undergraduate students at Universities, the educational program of the metalcasting industry at the college level, vocational schools, community colleges, four-year technology schools and traditional engineering school students. The book is also recommended as instructional tool for metalcasting facilities to train new employees, for suppliers to learn more about metalcasting and for libraries as reference material. The material contained in this textbook summarizes known basics and compliments them with the latest developments in all areas of metalcasting technique, technology and quality testing. There is also a Lab and Safety Manual (sold separately), which contains detailed instructions on major foundry laboratory testing methods, and has exercises aimed at obtaining practical “hands-on” experience in all aspects of metalcasting. The Lab Manual also contains general safety information and specific safety precautions applied to each testing procedures. 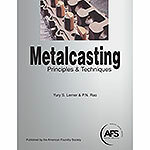 Metalcasting Principles & Techniques is also sold in a hardcover version (TE1300) and as part of a set along with the Lab and Safety Manual. Hardcover set –TEMCPTHC; softcover set–TEMCPTSC.